Montblanc launched a contest few months ago. It consisted in filming 1 second of beauty. I love the idea and wanted to do the same with the pupils. - Pupils have to take 1 picture representing their school. They have to write a text that explain the pic (or a mp3, or both) and the picture must be original and taken with a mobile phone. - Pupils have to take 2 pictures. One representing the most beautiful thing they know around them and One representing the most awful thing they know. They have to write or record an explanation. the pictures must be original and taken with a mobile phone. We then expose their work in an exhibition with a vote. The pupils had to promote Australia. They had to comment on an genuine commercial for tourism in Australia. Cover by Cassandra, Magarita & Sarah. We can deduce that on the left side , it's the perfect happy family, and on the other side the family after ben's bith. The artist may intend to denounce that ben is placed in the root of the family tree. It represents the most important members of the family. The book shows the fact that he is the one who destroyed everything. Moreover the fact that the title of the book is written in red with spines strengthens the fact that this fith child is spring of misfortune, of bad events. Every spine represents highly-rated dark one of its soul. However, the flames of the parm represent the hell ( as well as the one that he made live to his family) Futhermore every word represent a person of the family before and after Ben's birth. And the rainbow of the left shows the happiness which reigned. 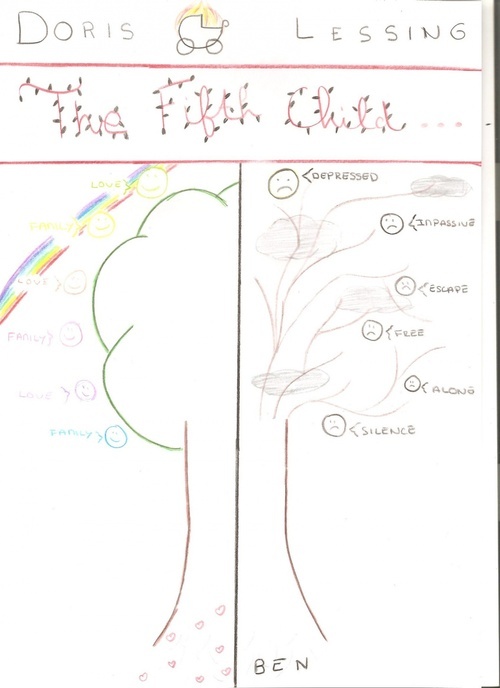 And the thunderstorm on the right shows the disaster which is provoked by ben. So the hearts of a highly-rated depicts the love between the members of the family. 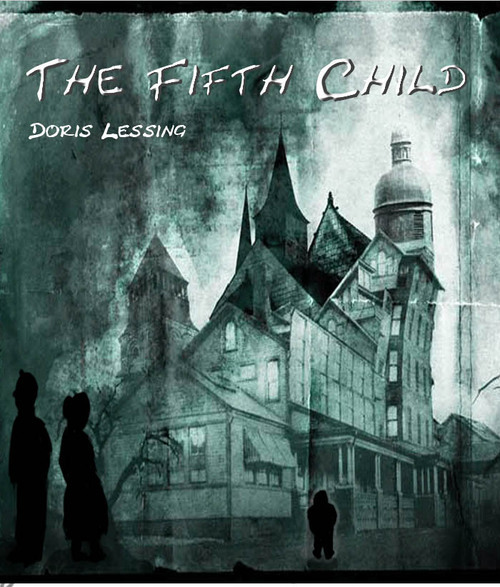 The document I’m going to talk to you about is a cover made by myself for Doris Lessing’s book, the fifth child. The plot is the story of Harriet and David, a British couple who have four children but when the fifth child arrived, he destroys the family and then full of problems coming. 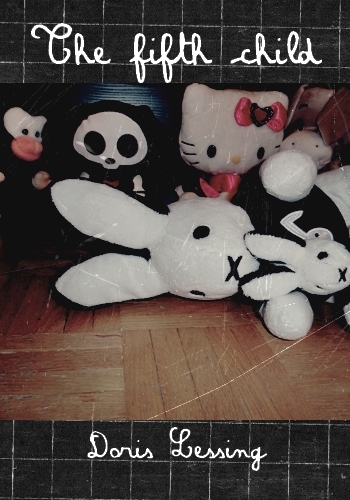 In the foreground there are two teddies which are lying on the floor contrary to the other teddy in the background which looks them. The photo has pale colors and some stripes like an old photo. At the top we can see the title of the book in child handwriting like the name of the author at the back; moreover the setting must be a blackboard. This cover remembers us the school period and focus on children universe. The teddies on the floor can represent Harriet and Ben: she holds and protects her son from her family who hate him because of his difference. So the four teddies symbolize Ben’s brothers and sisters. In conclusion, I choose to make this cover with teddies and blackboard because, in my opinion, the aim of the fifth child it’s the discrimination of a little boy, so I try to show that in my cover. Cover created by Victor, Kim, Auriane & Cathy. 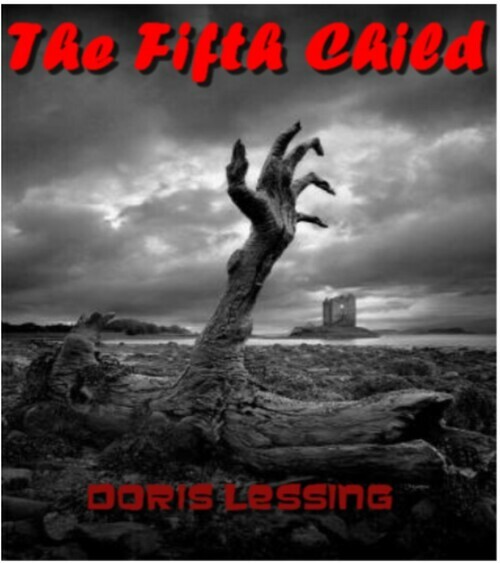 This is our cover of The Fifth Child. It's a black and white drawing, which represents Harriet and David in front of an institution. Ben is nearly the door. At the top we can see the title of the book, written in bold letter. Below there is the name of the author: Doris Lessing. In the foreground, there are three caracters. In the bottom left hand corner, there are two shadows. Indeed, we notice that one is looking at the institution and the other is looking away. 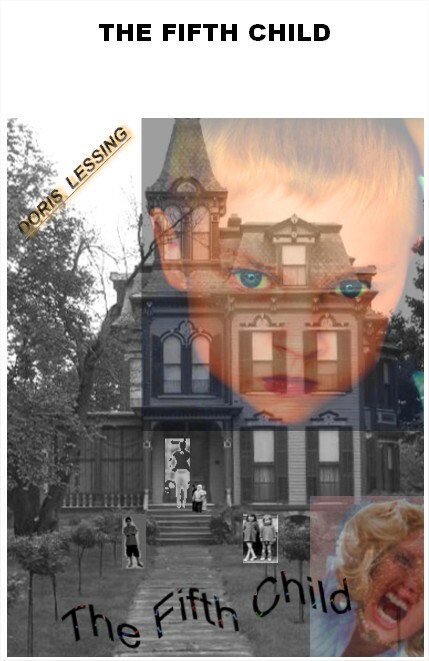 At the opposite, we can see a shadow of a child in front of a door: it seems that he is going in this institution. The mansion in the background is impressive, very high and dark. It's during the night and it's foggy. Firstly, the writting of the title give us a gloomy impression of the story, it makes us believing that it's an horror story. Moreover, the fog embodies the mystery of the atmosphere. Shadows represents the differents main characters of the novel. In fact we can see that David is not looking at the child, he seems not to care about Ben's leaving contrary to Harriet who is desperate, she seems to feel guilty because she has abandoned her son. We have noticed that in the book there is no chapters which permits to separate the different parts of the story but we can say that there are two parts; the first part is before the institution and the second is after. That's why we emphasize this transition with this drawing of the institution.